At the top of a tall, tall tower with a pointy roof, something is stirring. Lightning flashes, thunder roars and things go bump in the night! 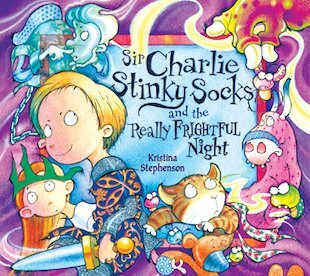 Enter Sir Charlie Stinky Socks – our honourable, brave, tenacious and courageous knight in shining armour! To retrieve the princess’s teddy bear, our pungent hero must face ghastly ghouls, headless ghosts and a dark danger lurking in the cellar. But will gallant Sir Charlie be able to thwart his many terrible foes – or will he succumb to the hideous Cellar Dweller? A hysterical tale of ghosts, gallant knights, quests, monsters and magic, which includes four giant flaps to unfold! I like the first picture because it looks quiet and peaceful, I can imagine it being a great castle to live in! My favourite character is Charlie Stinky Socks because he has a funny name. I rate this book 10/10, IT WAS THE BEST BOOK EVER!! !